YAY!! So they just called me from the Autobody shop and my poor little Nissan has been all put back together and is ready for me to come and pick up. I am going to work from home tomorrow so that I can go get it during the day. After the crash a couple of weeks ago I wasn’t really sure they would be able to fix the car at all. But it turns out it was mostly body damage with only a few other parts (cooling system and AC) that needed to be replaced. There was no major damage to the frame or the engine so everything was ‘fixable’. What’s shocking is that even though it was mostly body damage… the estimate the called me with just after the accident was just over $4000. But, on a good note insurance is covering the cost. I understand that cars these days are built to crumple like mine did. Apparently it is designed to spread the force of the impact around the car and lesson the overall structural damage. But it sure is scary to see it happen. I really wasn’t going all that fast on impact yet the car looked like I had crashed into a brick wall at high speed. I would be lying if I said it didn’t make me feel like it was a little bit ‘tin can like’ overall. And that doesn’t exactly bode well for feeling ‘safe’ behind the wheel. It seems like more often than not in today’s day and age the quality of things continues to degrade a little bit. Sure cars are getting cheaper every year…. but are they getting cheaper because we’re finding ways to make them with materials made cheaper by sacrificing the safety and strength that would once be required for such materials? I am not suggesting that we are by any means…. but you have to wonder. If you spend more for a vehicle are you getting a stronger, safer car?? I would guess that some would argue yes. But all that aside, I am looking forward to getting my car back. I’ve had a great rental car since the accident and have definitely gotten used to driving the bigger car with a few more robust features. But I still really enjoy driving my little car around. It will be nice to have things back to normal in that regard. I just hope that there are no residual (undetected) issues with the car that weren’t assessed, caught and fixed during this process. I really don’t want to spend the next few months going in and out of the dealership b/c something or other isn’t working properly. The overall mechanics of the car should be intact and working as expected…. 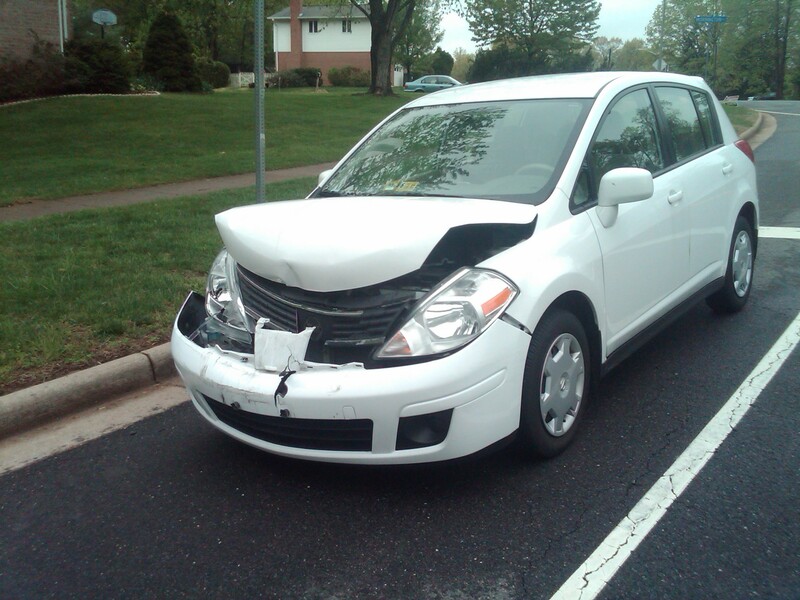 but what are the unpredictable side effects of a front end collision? I guess I will start to find out tomorrow. When I woke up this morning my plan was to go pick up X and take her to a “Stream Monitoring” event out in Fairfax. This was an event organized by the NOVA Big Brothers and Sisters group and X and I were both very much looking forward to it. Stream Monitoring is basically what you’d guess. Monitoring the stream to check in the health of the ecosystem. The health of the stream is determined by the variety of organisms that are living in the stream. Most especially by the ratio of sensitive to non-sensitive organisms. There are some creatures that can live in any water (those would be the non-sensitive ones) and others that can only survive in clean water (you guessed it – the sensitive ones). Basically what we’d be doing is pulling on some rubber boats and wading into the water and stirring up the stream bed to find various lifeforms that live in the water, under rocks and sand. Then we’d collect them and place them into individual water filled containers so they could be identified. Once identified we’d be able to figure out how many were the sensitive variety and how many were the non-sensitive ones. Doing this would help us determine the general health of the stream. It was a group event planned for the kids to do something ‘eco-friendly’ and learn about the earth and the eco-system within the stream. Seemed like a great event for Earth Day 2011 and as I said X and I were very much looking forward to it. However, it seems the universe had a different kind of learning experience in mind for X and I today. As we were headed to the event we were in a bit of a car crash. We were driving down the street and coming up to a stop sign (going down a bit of a hill). The roads were wet still from yesterday’s rain. There was a car in front of me – who stopped at the stop sign of course. As I hit my brakes to stop …. well I am not sure what actually happened, if they locked up or if they just plain didn’t work but I couldn’t stop and we slid down the hill and right into the back end of the car that was at the stop sign. Luckily noone was hurt and there was very little damage to the car I hit. 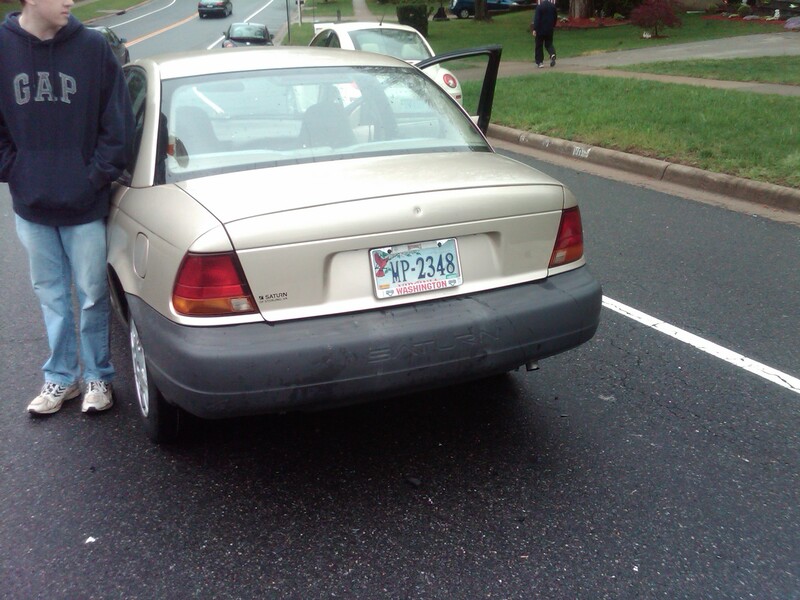 My car however was totaled… Which in itself was a little disturbing – given that we weren’t going fast at all. X was a rock star. I was way more shaken by the whole thing than she was. She just hung out and ate her Easter candy while I talked to the people from the other car and called the tow truck and dealt with my insurance. She called her mom to come and get her but otherwise just sat there unruffled. While certainly not the learning experience I had in mind for today it was definitely something she won’t forget any time soon. I will say that Allstate is a superb insurance company. All the claims they make about being there for you and making sure that everything is taken care of – all true. The woman that helped me out was incredible. And my coverage & protection plan and accumulated ‘good driver’ points meant that my deductible was fully waived and that I had an accident forgiveness clause meaning my premiums won’t increase at all as a result of this accident – which was 100% without a doubt my fault. They will even pay for the cost of towing my car to the repair shop AND have arranged for a rental car for me until mine is repaired or written off. So while today wasn’t exactly the day that I had in mind when I got up. It could have ended much worse. I’m fine. X is fine. The people in the other car are fine. And all in all it’s not going to cost me a bundle of money to get things back to normal. I think that maybe I will just stay in tonight and chill with my BF. I don’t want to attract any more unexpected drama – one big unexpected event is enough for one night I think.